Description Clamp-On round rail to 7/8" dia. Features fixed vertical angle to optimize rod positioning. Smaller size is perfect for medium and light action gear. Rod throat opening fits most standard and ultra-light rods up to 1-3/16" diameter. Locking ring fits spinning reel handle shanks up to 7/16" diameter. Rod holders are precision-made of rust-resistant stainless steel and hard coat anodized aluminum for fresh and salt water applications. They have a unique 360° full hemisphere of possible positions. Easily adjusted and locked into exact position for optimum fishing performance. The rod holders can quickly be removed from the base mount for storage. Fatal Flight Camo covered stainless steel tube/black anodized aluminum. Additonal 25°, 45° and 90° posi-lock deep water trolling positions. 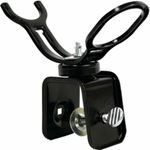 Perko 0449DP0CHR ROD HOLDER 1-5/8IN ID. CHR. For optimum fishing performance, gives you a 360° full hemisphere of possible positions. The mounting base on all models can be easily removed from the unit for storage. The permanent mount and clamp mount are interchangeable. Precision made out of rust-resistant stainless steel/aluminum for fresh and saltwater fishing. Permanent mount. 1-3/4" diameter. Can be permanently mounted to dock or boat. Fasteners included.